Getting autographs was a big deal, and possibly is still a big deal to some, but not like it was in the 80s and 90s. Nowadays, I don’t mind one way or another if I get some star to sign a book or an album. Autograph books were big—blank books that you’d harass celebs and quasi-celebs into defacing. There were magazines dedicated to the search and trade of autographs. People even forged autographs, and I’m sure they still do. Today, I’m taking a look at the autographs in my own personal collection and reliving the tales. I haven’t met many celebrities face-to-face, but I do have a couple autographed pieces in my collection. This one might be cheating, but I’m not too concerned. 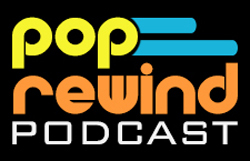 The first is a signed padded envelope from Joey McIntyre of the New Kids on the Block. I’m a big NKOTB fan and when Joey went rogue in 1998 and released his first solo album Stay the Same on BNA, I had to have it. It was sold through his website and I remember reading on the message boards that other fans had spotted Joey out and about and he had a trunkful of albums he was handing out. 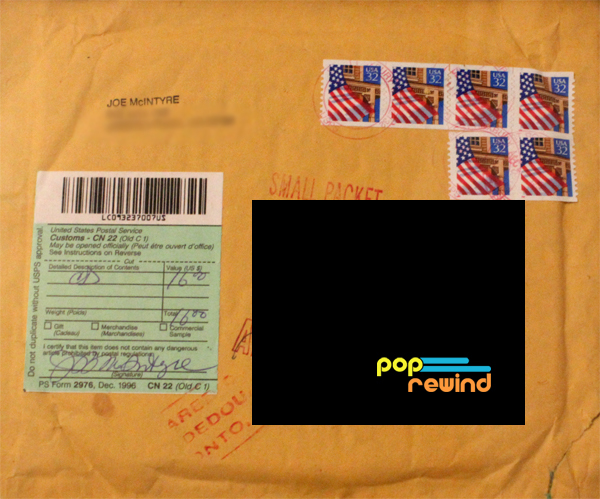 I paid my $16 and it looks like Joey himself mailed it to me, since it looks like J M McIntyre on the Customs label. Hey, I’ll take it! The second is the one and only Bruce Campbell—he was doing a signing at the bookstore in the mall in 2001 or so. I happened to be at the mall with a group of friends that day and none of us had any idea that Bruce Campbell would be there. The bookstore was packed and there was no chance to get any personal time in with Bruce. All the numbers were taken. We went to the Computer Center-type store, used their printers to print out a few Penny Arcade comic strips that Bruce had made a cameo in (unbeknownst to him, I’m sure), and took them with us to the bookstore where we hid behind shelves and watched Bruce. We didn’t get a chance to meet Bruce, just creepily stare from afar. My friend’s pal worked at said bookstore and took our comics for him to sign after the store closed. 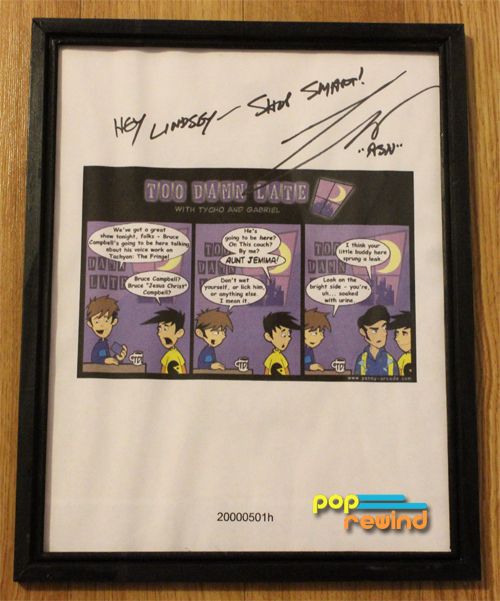 And thus I have a signed Bruce Campbell Penny Arcade comic. Doh Doh showing off and acting cool, rocking at the Tiki pool. 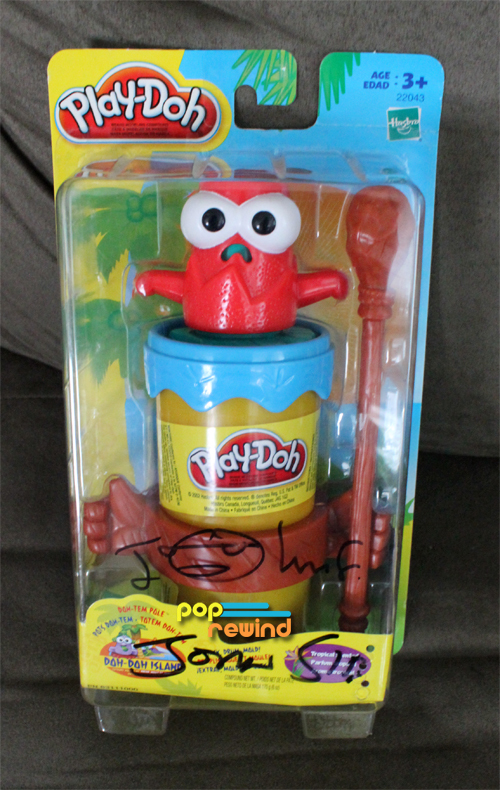 Lastly is a Doh Doh Island figure from Play Doh signed by John Flansburgh and John Linnell from They Might Be Giants. Lee and I went to see They Might Be Giants shortly after Here Come the ABCs was released in 2005 and I decided that along with getting my album signed, that I would also bring along something unusual. John Flansburgh did the music for a Doh Doh Island commercial, so I picked up a cheap add-on for him to sign. When I brought it up there, he laughed, said he’d never even seen these and it was the first time anyone had brought them a Doh-Doh Island to sign. Score! But, that wasn’t the strangest thing anyone brought in that night—someone else brought in a large missile to sign. I’m not that out of my mind in comparison. Do you have any autographs? Is there someone’s autograph you’d love to get? Leave us a comment below! How does one bring in a large missile to sign? !